Copenhagen rainbows in the -10 degree Celcius winter weather. Love your blog!! very unique! this blog is such an epic win! The woman in the fist picture could very nearly serve as a role model for how to use a "sport" bike for basic transportation. Note that the frame is sized to her, rather than expecting her to size herself to it. The bars are raised to maximum, rather than lowered to minimum. The combination means that riding on the tops as she is she is sitting up nearly as much as the woman in the last photo. And of course she's wearing the same clothes she would to walk. One does not have to be a contortionist sprayed with neon plastic in order to ride a drop bar bike. Something even racers knew for the first 100 years of safety bike history. I'm still not sure why they forgot. The drop bar bike looks immensely huge, like a 60cm+ size meant for someone 6'4" or more, also the drop bars look like they have been rotated down too far which makes it uncomfortable on the hoods. I'm 5'9" and I'm quite comfortable on a 60cm. Not a modern 60cm, that would be way too big; a classic 60cm. It is the size I started serious racing on (when I was 13 and a bit shorter) and was the proper "fistful of seatpost" size standard at the time (they used to like frames a bit bigger than that). I didn't look at the headtube to determine that it was a good size for her. I looked at her arse. She's not sitting on the top tube. I also looked at her knees and elbows. It's just possible that she's, ya know; tall. It's been known to happen in Denmark. "the drop bars look like they have been rotated down too far"
Yes, I did say "very nearly." Had I qualified that I would have said "she has handlebar issues." Not only are they rotated down, but the brake levers are mounted too low on the bends. But I didn't want to turn the whole thing into a bike geek critique. These colours can brighten the winter ! I'd like a bicycle like that. It's certainly a large bike, but then she looks OK on it so she must be fairly tall. Yes the bars are a little too down-turned. Perhaps she just likes them that way. I agree that the brake levers are a bit lower than I would prefer, but I am not riding that bike. 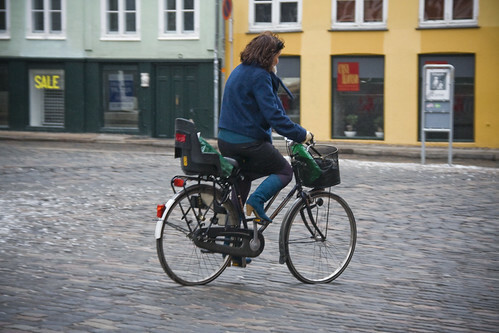 In Copenhagen I suspect the average citizen rides more kilometeres in a year than the average American cyclist does in 2 or 3. You have a beautiful world in Copenhagen! It could be borrowed, of course, but there's nothing in the photo to suggest it. She looks right on it; which is what drew my initial comment. And I'm not critiquing HER (she likely doesn't even know I exist), per se, but on the concept of riding a drop bar bike in other than the current (pseudo) racer fashion. In a manner that Mikael would put up as an example of CCC despite his predilection for sit up straight, step through bikes. Her image appears here and I note that it represents a mostly perfect example and my comments on the not so perfect were drawn out in response to another comment. When it comes to bars some people simply don't know how much more comfortable they could be because they've never ridden a bike set up otherwise and/or understand the differences; even in Copenhagen. I see some of them even use straight bars which have absolutely nothing to recommend them in other than very specialized sporting use and the almost straight bars are almost as bad (see the bent wrists on Miss Purple Hat). And this person could be riding the hoods (and thus with access to the brakes) more comfortably than she is riding the tops; without giving up any of the advantages of drops; as could anyone else who might want to ride a drop bar on a city bike but finds them uncomfortable and hard to reach the brakes when sitting up. How to build a better city bike for better city riders, which it is my understanding what this blog is largely about. And this woman could very nearly serve as a role model for that. Your blog is fantastic! 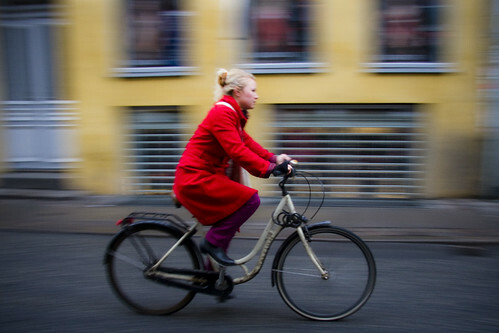 Although I don't ride bycicles I was hooked on it for its quality and photos. I wish you all the best and I'll recommend your blog to my friends. i super super duper like it!!! What's a drop bar again? Cold someone remind me? I've been following for over a year now and really love it. It has me wanting to get over there for a visit one day. I'm always showing it to my friends and family to help them be more aware of 'cycling as a lifestyle'. 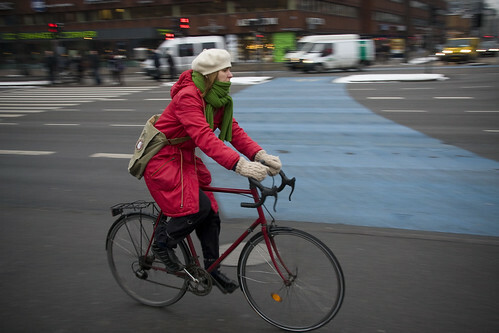 Also, since you take such fantastic colorful photos, I was wondering if you might ever consider putting out a 'Copenhagen Cycle Chic' calender? hey paul, from kalispell. Thanks! We've had a calendar for two years now :-) Here's the 2010 version available online. As well as other merchandise here. OK, I've found out that drop bars are the ram's horn handlebars on racing bikes... Hoods? BTW, I get the impression that the past couple of weeks there has been a bit of a spam plague that I don't recall seeing before. Something to ask Google about, I would think. "I've found out that drop bars are the ram's horn handlebars on racing bikes"
That's the most common kind these days and thus what most people are referring to when they simply say "drops," and the kind in question here. There are other kinds of ram's horns not intended for racing (which is what I would recommend for this woman) and other kinds of drops as well (turn a North Road upside down and it's a drop instead of a riser; and not a bad strategy for someone who just occasionally likes to feel a bit sporty. It doesn't require buying anything new). The body of the brake levers, which are shaped as handles to be held. It's a relaxed but semi-aero position that allows the use of the brakes without moving your hands; just extend a couple of fingers. On a taller and shorter "cockpit" bike than is the fashion these days (a smaller frame has to be made proportionally longer, so if you just try to buy a "bigger" frame you'll be uncomfortably stretched out) this is a very comfortable position either in city traffic or on the long haul. On my own bike (a Rivendell Quickbeam) when "riding the hoods" I'm leaning forward a bit, but not in the least hunched over even with a good bend in my elbows. Because the bike was designed to be COMFORTABLY efficient, not speed efficient; but over the long haul comfort equals speed; not to mention stability and control (so I won't mention them). And yes, the spam is beginning to get offensive. did anyone mention she's got downtube shifters. I bet she gets down in the drops and hammers that piece of steel in the country when the weather is better. I am in love with a girl from Copenhagen. Again. I love these photographs! They're so original and I agree, I really want that coat! Being a Blog of Note must mean exposure and spam. Still a well deserved honor! I enjoy this blog very much. Rekindles my desire to get on the bicycle again. Thanks! the increased spam is due to the fact that the blog was chosen as a blog of note by blogger dot com. nice for traffic, not so for spam. I confess that being a bit older than the lovelies in these photos, when it is -10c I do wear a hat and warm gloves. As to another person asking where to get a bicycle, it depends on your needs. You can quite rightly start out with a second-hand one if it is trustworthy and you know it isn't stolen; the important thing is that it fits you properly. In town I much prefer old-fashioned sit-up-and-beg bicycles to mountain bikes or road bikes. It depends how much and where you want to ride, how much you want to spend, what you will be wearing etc. I wear skirts a lot so I prefer a so-called women's frame (also better for anyone with stiff joints). Remember that if you have a new expensive-looking one it is more likely to be stolen. So happy birthday Mikael and hello to both of you in your capitals of cycling chic and cycling cool (aka everyday cycling).